Since featuring Scott Howell’s Squidro pattern in the Fly Patterns section of my site I have had a number of inquiries regarding how the original Intruders were first rigged. Today, most people rig their Intruders using a short stiff loop of Dacron backing, gel-spun braid or knottable bite tippet attached to the rear of the shank prior to tying. Once the Intruder is completed the hook is connected to the loop via a loop to loop connection. Originally, Intruders were rigged by running the leader or tippet material through the hook eye externally along the top of the fly through a small loop of back or stiff mono tied in at the rear of the hook and then through a small section of tubing. 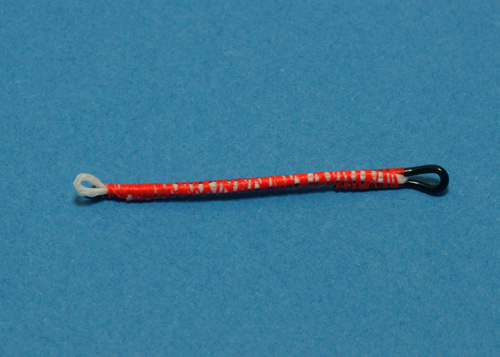 The hook was then tied on and pushed into the junction tubing which was in turn stabbed onto the hook shank, similar in some respects as to how tube flies are rigged. Many steelheaders I talk still prefer or are now rigging their Intruders using original rigging practices out of concern for fish welfare. Intruders with too long a loop run a serious risk of deep hooking and mortally wounding the fish. Listed below a couple of methods of how Intruders were originally rigged. In the first example I have elminated the Intruder’s body materials so you can clearly see how the rigging is done. I have used some hi-vis mono for demonstration purposes only. 1) Take a length of suitable strength backing, gel spun braid or knottable bite tippet and form a small loop. Tie in the loop at the rear of the shank so the loop is no larger than ¼”. Once the loop is initially secured slide the tag ends of the loop forward through the hook eye. Wind the tying thread forward onto the wire return of the hook eye. Double the tag ends under the shank and secure in place. 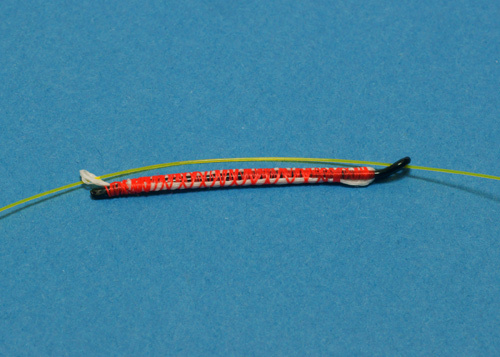 Remember to leave enough of the shank bare to push on a short length of tubing to hold the hook and leader in place. 2) Pass the leader through the hook eye, along the back of the fly through the small loop at the rear of the shank. To view the rest of this article, please login or join now for free!